Spot check at the A2/A251 junctions. All flowing freely. The biggest stand-out? Cars being driven too quickly through the junction. Stamping of accelerators. Stamping of brakes. 1 in 50 driving much too dangerously. The situation isn’t helped by the super-wide junction “splays” that allow cars to drive quickly around corners. Often much too quickly to be able to avoid someone who might have been crossing at the time. It beggars belief. The junction of Athelstan Road and Forbes Road is a prime example. Here, the splay is so generous that cars barely need to slow down when turning left from Forbes Road into Athelstan Road. Likewise, the junction of Briton Road and Forbes Road. 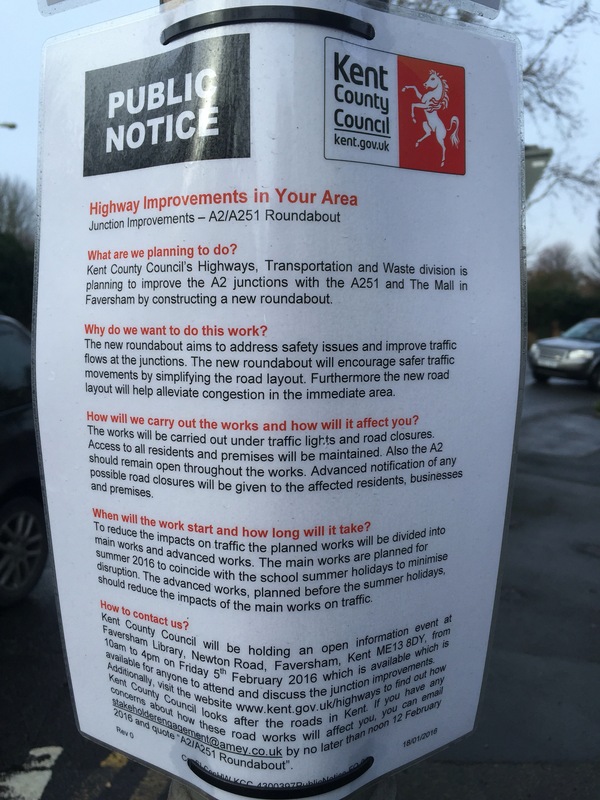 Instead of spending close to half a million pounds on a roundabout that isn’t needed, Kent County Council could allocate a fraction of this sum to junction improvements that reinforce a 20mph speed limit and encourage walking and cycling in Faversham. Another morning spent observing traffic at the junction of The Mall and the A2. 3. traffic was flowing freely through the junction with only one very short period when traffic built up down The Mall, between 0844 and 0846. Once again, these appear to be normal conditions. This is not to say that the junction doesn’t have problems. It can indeed be badly congested when there is an abnormal incident such as an accident on the M2 or a temporary closure elsewhere. If indeed it is the case that the junction generally flows freely – and comments from others support my observations – then the proposed designs are not serving the transport need. They are not helping schoolchildren and other vulnerable road users cross the road. There is no general traffic congestion need that can be solved by enhancing the capacity of the junction. Nor, given the extreme congestion that can iccur when a local road is blocked, are the proposals going to address abnormal conditions. Instead the proposals will harm everyday traffic movement by banning turns and sending frustrated drivers on longer journeys down local streets. And they will do nothing for pedestrians or cyclists. Not unlike trying to boil the ocean, the A2/A251 proposals are the wrong solution to the wrong need. The reality is that the proposals are not what Faversham needs. Instead, what is needed is support for walking and cycling throughout the town. Why? Because the future growth of Faversham means that there must be a significant “modal shift” towards walking and cycling rather than more of the same car-focused thinking. Otherwise it is jam today and jam tomorrow. Air quality and carbon emissions targets should also be pushing policymakers and transport planners in this direction. Finally, budget constraints mean that lower prices and better value projects need to be pursued. Walking and cycling projects fit the bill, whether the priority is congestion relief, air quality enhancement, carbon emissions reduction or cost control. A move to a 20mph speed limit will also help more traffic through the junction. Kent County Council should be responding to the pressing, long-term needs of the town rather than pursuing an impossible quest to solve an intractable problem. The answers are there but Kent County Council won’t see them until it shifts its mindset away from car-centric thinking. Proposals for the junctions of The Mall with the A2 and the A2 with the Ashford Road have been published by Kent County Council. The proposals are unacceptable. They will send more traffic through the congested A2/A251 junction than at present. They will push traffic down local roads. They do nothing to promote pedestrian or cycling movement. Faversham Town Council and Swale Borough Council should oppose them in the strongest terms. The proposals have two significant failings. First, the proposals ban traffic from turning right out of The Mall into the A2. This turning is made by perhaps 10% of all vehicles moving out of The Mall onto the A2. The consequence of the ban is that vehicles wanting to make the right turn will either need to find an alternative route through nearby back streets, thus putting more traffic down these residential streets or, more likely, they will turn left out of The Mall and then make a U-turn at the roundabout. The effect of this will be to put even more traffic through the junction with the A2 and the Ashford Road than is currently the case. The proposals therefore risk exacerbating the situation rather than reducing it. Second, the proposals take westbound traffic turning right from the A2 into The Mall into the same single lane that is used by eastbound traffic turning left from the A2 into The Mall. At present, eastbound traffic and westbound traffic turning into The Mall do so in two separate lanes either side of the central island. The way it works today is that if westbound right-turning traffic sees eastbound traffic that is indicating to make the left turn then this is a signal that the right-turning traffic can also make the turn since the left-turning traffic will be slowing down and creating a gap for the right-turning traffic. As a result, westbound traffic turning right into The Mall today only has to wait for a gap in the traffic that is heading east along the A2. This possibility is done away with in the proposals since any westbound traffic wanting to make the right turn into The Mall will have to wait until any eastbound traffic making the left turn has done so. This will reduce the efficiency of the junction for right-turning traffic. This is especially significant because westbound right-turning traffic creates much of the congestion in the current situation. The proposals make inadequate provision for pedestrian crossings. The only crossing provided is an informal one that connects a small number of destinations to the south east of the roundabout with the town centre. While helpful for those few destinations, the crossing is of limited use otherwise and certainly not an adequate response for the junction as a whole. The proposals therefore fail to encourage active travel on foot. The proposals therefore fail to encourage active travel by cycle. 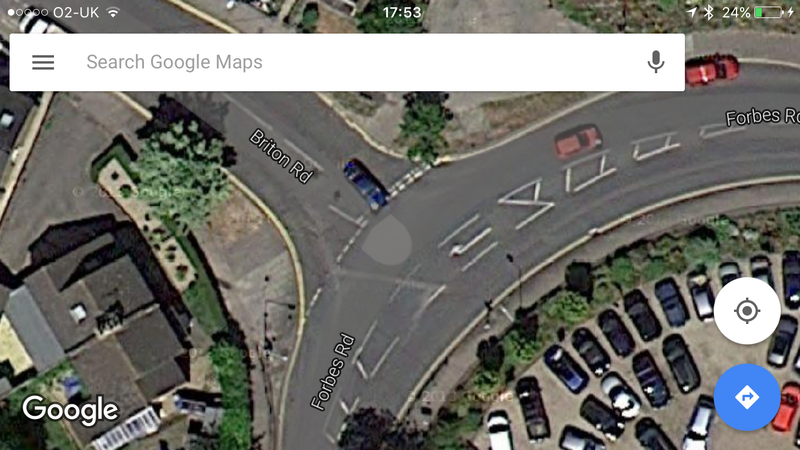 So what could be done to improve the junction? Mark Gardner makes a typically good point (Faversham News, Gardner Digs, October 1, 2015) in suggesting that Faversham drivers should grin and bear it at the “modestly” congested junction of Ashford Road/A2/The Mall, rather than submit to the expensive and uncertain outcome of traffic lights or roundabouts. In fact drivers could go one step further and slow down to a maximum of 20mph as they approach the junction. In doing so they might find, contrary to perceived wisdom, they actually get through the junction faster. Why? Because junctions become more efficient at lower speeds. If you don’t believe me, you can try it yourself. Next time you drive through, take five or ten miles off your speed. What you might find is that cars waiting to turn into the road ahead of you are able to do so more easily. Rather than having to wait for you – and perhaps the chain of speeding cars behind you – to get through, they can instead slip in to the road ahead of you. Now imagine what would happen if most people did this. The entire junction would flow more efficiently. Before we spend tens of thousands of pounds on lights or roundabouts, we could carry out a no-cost experiment by driving at 20, not 30mph through the junction. 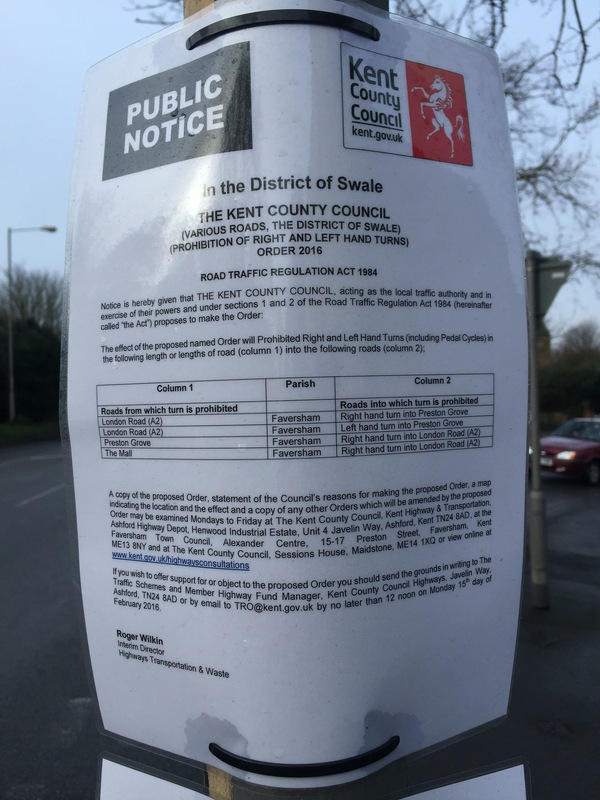 If this works then, for a modest cost – well below the capital expense of the municipal transport paraphernalia currently under consideration – we could install 20mph signs and begin the transformation of Faversham’s driving culture. At 20mph drivers can nod, wave and smile at each other. Now fancy that. We might use all five fingers to greet each other and not just one or two.